I have a love affair with America. Over the years, we’ve returned to Florida numerous times, I’ve been to New York, San Francisco, done a tour from LA to New Orleans (stopping off at some brilliant cities along the way) and most recently been back to New York and Boston. Not to mention also that I’m planning on doing a bit of a road trip this year too if the bank account allows it! I’m very lucky in the fact I have been able to go to these places. When I did my tour a couple of years back, I travelled through some of the southern states, I had amazing fried chicken – this is a massive guilty pleasure of mine. It has to be good and home-made style with gravy and cornbread rather than mass produced questionable chicken you get over here. I know we live in health conscience times and that’s great and all but some times you need a naughty fried treat. Unfortunately while I was out there, there wasn’t a Super Bowl taking place but we did get to throw a ball around on the Dallas Cowboy pitch- awesome or what! After having a nose around the changing rooms and checking them out for any lost cowboys, we ended up in the world’s largest Hooters – classy right? Weirdly it wasn’t too bad – the Aussie guys I was with probably had a slightly better time than me, but don’t know the reason why they did…. There we had a bucket of buffalo wings to share. Oh my! 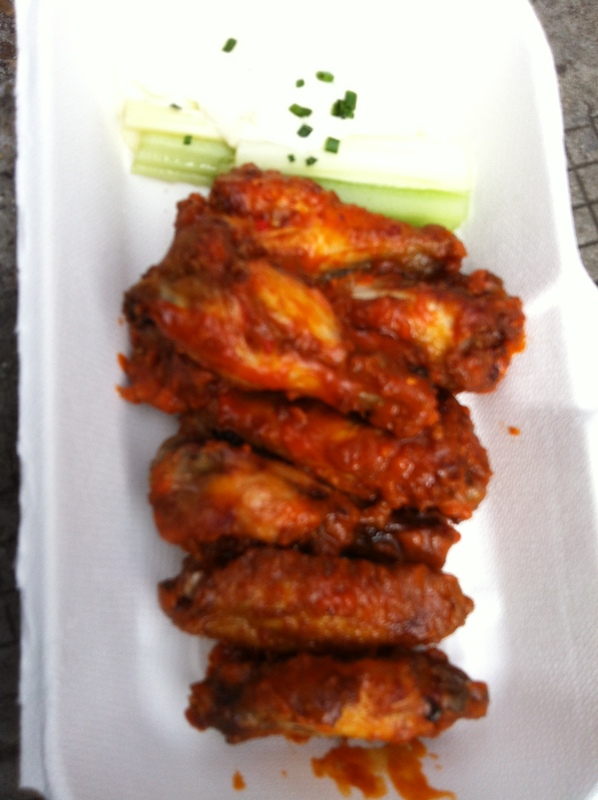 Think we gnawed through 50 wings in no time at all, dunking as we go with the blue cheese sauce. Nom. Over in the Uk at the moment you can only really get barbecued wings and only a few places have started doing quality buffalo wings. 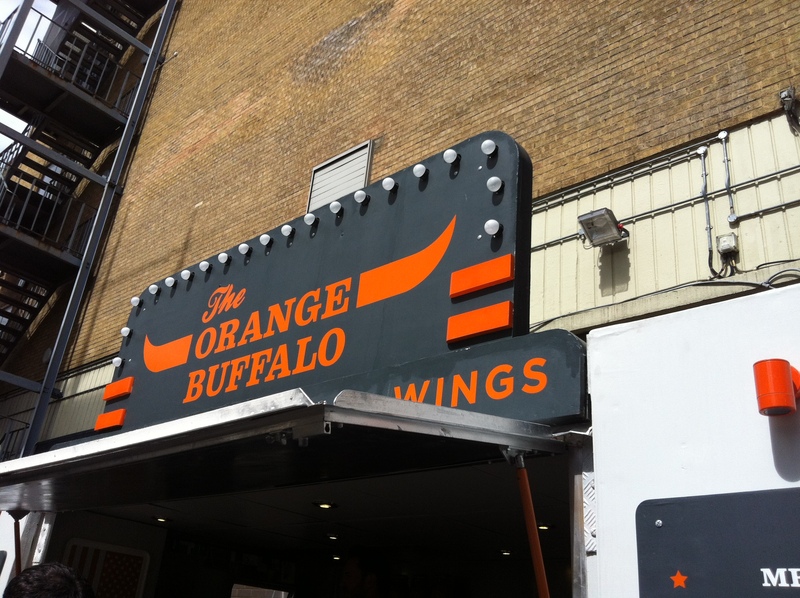 One of those places was The Orange Buffalo, one of the places I visited in London on my research trip. 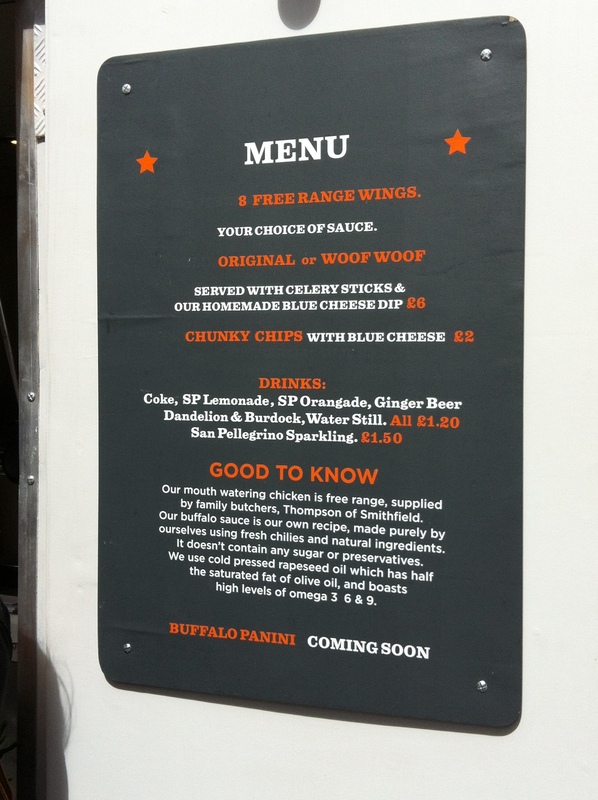 We stumbled upon them just off Brick Lane, and buffalo wings are no where near what we do and make at work but they just looked so tempting that we had to have a go! Giving you three delicious chilli sauces to go for we went for half the wings in Original Sauce (Dutch Chillies- medium heat) and half Woof Woof Sauce (Dutch Chilli, Scotch Bonnets and Naga Chilli)- lip tingling! There was also the Viper which scared us just a tad! Served with the classic blue cheese dressing and celery sticks- we polish 6 free range buffalo chicken wings in no time. Yum! If you’re in the area, you should look them up! So after all that bone gnawing, I thought I would give it a go and make some my own. There are different legends of how they came about – mostly coming from Buffalo, NY – not actually using buffalo meat. 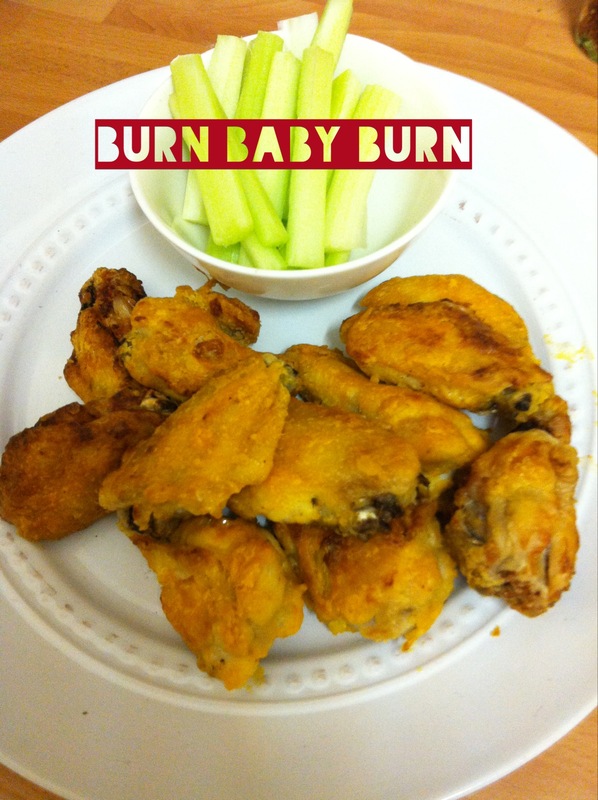 All using deep fried wings unbreaded then coated in a hot sauce and butter combo. Served with blue cheese dressing and celery sticks- apparently as the heat compounds in chillies aren’t water soluble so you need something fatty like the blue cheese dressing to tame the fire. Supposed the celery helps with the cooling too! And oh my sometimes that’s needed! To do the real deal I ordered some of Frank’s Buffalo Sauce online but I’m guessing there’s all sorts out there you can try out. The next thing to think about is to whether to fry or grill or boil then fry or boil then grill, there’s so many variations out there that people swear is the best method for them! Unfortunately the little fryer I have would take forever to feed my friends the volume of wings they demand so I baked them on a rack to crisp up. Maybe when it’s just me, I might fry some up for a treat. So the following recipe is a mash of all sorts of recipes I’ve seen and advice people have given to make these bad boys. Line your grill tray with foil (so it’s not a huge pain to clean up afterwards!) and place a rack on top. Place the flour, cayenne pepper, garlic powder and salt in a big food bag and shake to mix. Add the wings, seal the bag and toss until coated well. Place the wings on the prepared rack over the tin and place in the fridge for 30 mins. This will help dry them out. 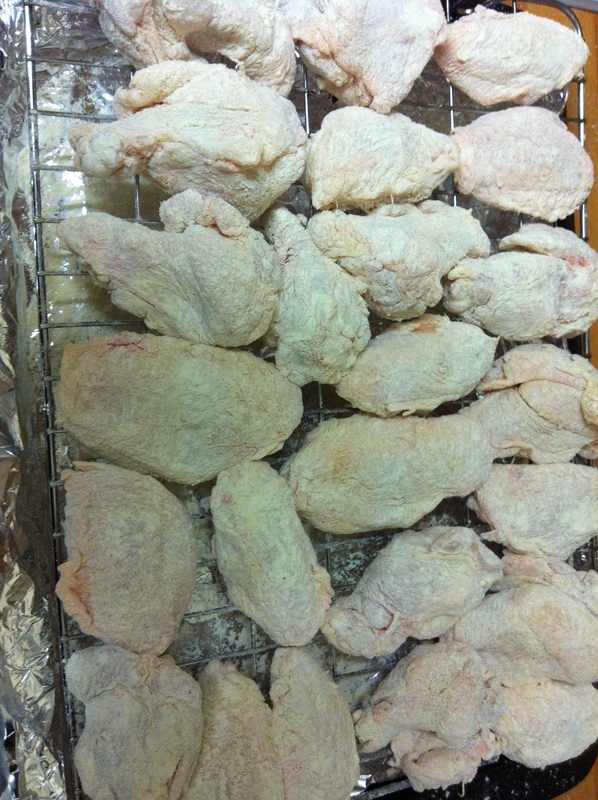 I also patted the wings with kitchen towel before adding them to the flour to dry them more. Oven to 200C. 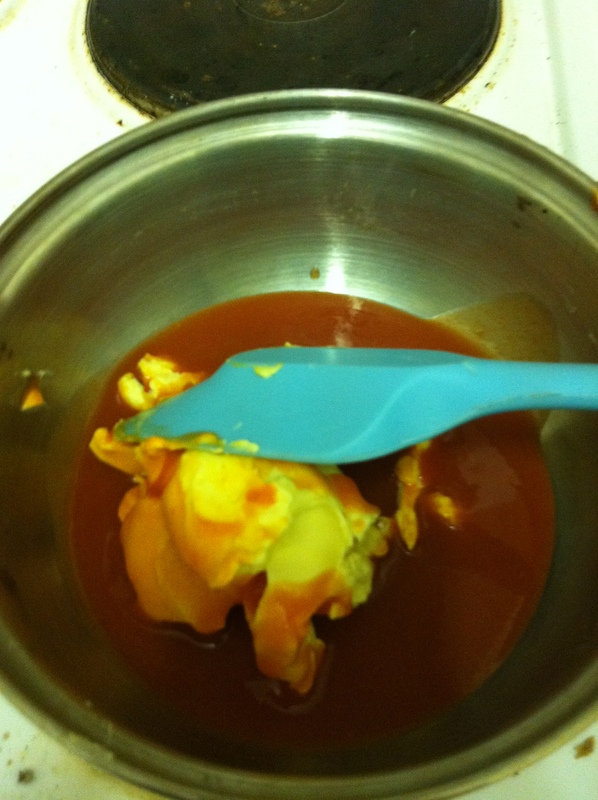 Whisk the melted butter and hot sauce in a small bowl. Dip the wings into the butter mixture and place back on the rack. 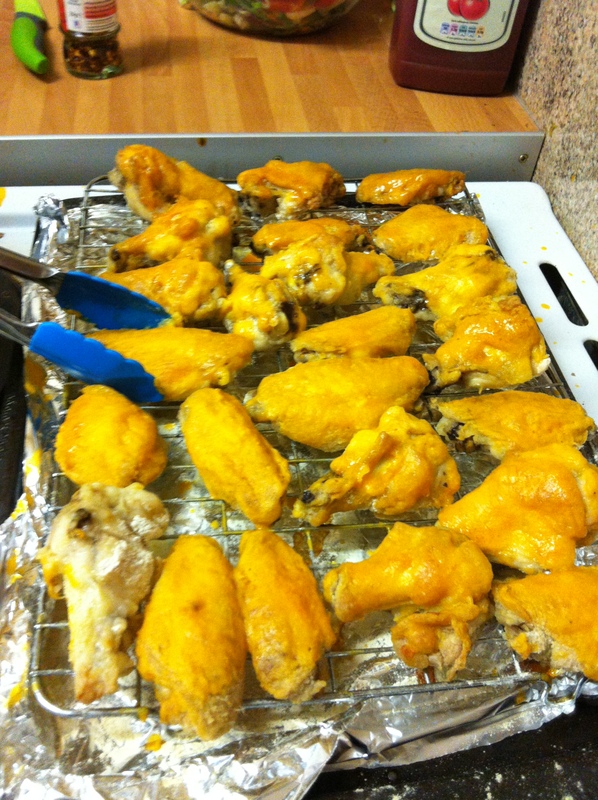 Bake for around 45 minutes and turn the wings over halfway to cook evenly. Baste on more of the sauce halfway through to get a good coating. I don’t massively like blue cheese and one of my friends was allergic to blue cheese so instead, I came up with this dip to help us cool down! Crumble the Boursin into a bowl and mix in the sour cream. Simples!